The differences between China and the U.S. over the South China Sea issue have become a matter of concern and even anxiety. But some of the perceptions in the U.S. and elsewhere about China's policy and intentions in the area are misplaced. A pressing task is to understand the facts and China's intentions correctly so as to avoid real danger and consequences as a result of misinterpretation and miscalculation. The issues in the South China Sea revolve around territorial and maritime jurisdiction. China believes it is doing nothing more than maintaining and defending legitimate territorial claims and maritime rights. Reclamation and construction works have taken place on islands and reefs that have long been under China's control, and many of the facilities are for civilian purposes and public good, such as navigation and rescue services, emergency relief, scientific research, and environmental protection. There are limited defense facilities, but they do not represent a "militarization" of the area. We believe that recent statements and military deployments by the U.S. have had the effect of escalating tension in the region and, if not curbed, risk the very militarization we all wish to avoid. Some people have called on China to abide by the United Nations Convention on the Law of the Sea, and to agree to international arbitration, which was initiated by the Philippines. But these same people are denying China's rights under the convention. Our view is that the convention does not cover sovereignty and territorial issues -- yet the very subject of the arbitration is territorial sovereignty. China will therefore neither participate nor accept the arbitration, for we maintain that the tribunal has no jurisdiction in this realm. Besides, it is ironic that the U.S. seeks to use against us a United Nations convention that it itself has refused to ratify. The concept of freedom of navigation is frequently used to justify actions by the U.S. in the South China Sea. This is an additional irony. The U.S. has used "freedom-of-navigation" operations to challenge the very concept as it was defined by the convention, believing treaty provisions would restrict its navy's ability to move freely around the world. Worst of all, China's policy on the South China Sea has been grossly misperceived as a strategic move to challenge U.S. dominance in the Asia-Pacific region and the world. Some people even go so far as to raise the idea of a so-called Asian version of the Monroe Doctrine. However, China believes that the concept of sphere of influence is out-of-date in the 21st century. China consistently strives for regional cooperation, and we respect America's traditional presence and legitimate interests in the Asia-Pacific region. The reality is not that China is trying to drive anyone out, but that there are attempts to deny China's legitimate and expanding interests in its own region. Indeed, China has long called for peaceful and direct negotiations directly with relevant claimant states to manage and eventually resolve the South China Sea disputes. This remains unchanged -- just as we remain open to working to forge a code of conduct for the region with the 10 ASEAN countries. 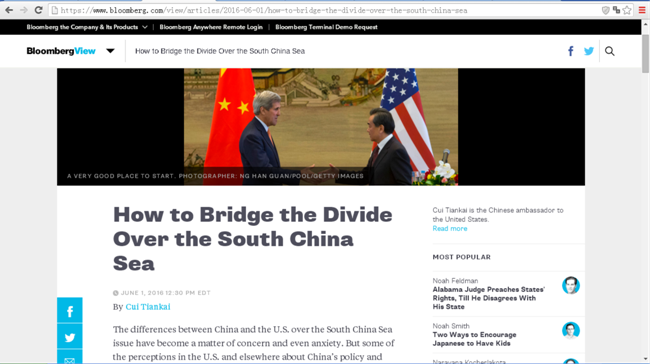 China-U.S. relations are too important for us to allow them to be hijacked by the South China Sea issue. We may have major differences, but we also share important interests, including maintaining regional peace and stability, supporting freedom of navigation and overflight in accordance with international law, and resolving disputes through peaceful negotiations and diplomatic dialogue. The region should not become a competing ground for China and the U.S. In fact, we have significant potential for cooperation in this region and beyond. Witness our coast guards, which patrolled jointly to enforce the fishery rules in the western Pacific. The good news is that leaders in China and the United States have demonstrated the political will to manage our differences and keep them under control. We continue to talk. We on the Chinese side are ready to work in a constructive manner -- and we are hopeful that the U.S. will demonstrate the same spirit.